... and yet so far. 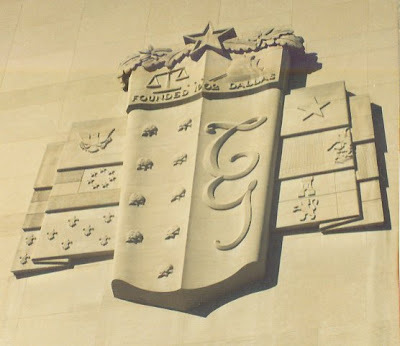 That is to say, renditions of heraldry or other insignia that come close to, but fall just short of, being accurate depictions of what they are supposed to represent. As you can see, the design consists of a shield divided per pale with nine things that look to me like oak leaves on the dexter side, and a large "TG" in pale on the sinister side, the field surmounted by a chief with a standing balance and, I believe, a ship under sail over the words "Founded 1902 Dallas", the whole surmounted by the Lone Star of Texas and an oak leaf spray. The part that I wanted to draw your attention to, however, is the six flags flanking the shield. These represent, mostly very well, the six flags that have flown over Texas in the course of its history. We have, at bottom left, France; bottom right, Spain (well, the arms of the combined kingdoms of Castine and Leon); center left, the Confederate States of America's "Stars and Bars"; at center right, Mexico; at top right, the Republic of Texas (which is also the flag of the State of Texas today); and then on the upper left, ... well, no, that's not the flag of the United States of America. It's a plain "flag" on which is placed the bald eagle from the Great Seal of the United States, holding olive branches in its dexter talon and a sheaf of arrows in its left, on its breast a shield of the arms of the United States. So, five actual flags, and one "mash-up" that has never been used as a flag in the nation's history. As I said, so near, and yet so far.